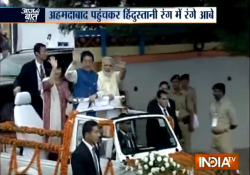 Prime Minister Narendra Modi and the visiting Japanese PM Shinzo Abe took out a roadshow from the airport in Ahmedabad yesterday and were greeted by thousands of admirers. Those who understand politics know that Abe’s visit will prove to be beneficial to BJP in the forthcoming Gujarat assembly elections. But what happened in Ahmedabad on Wednesday was a trailer. The real picture was unveiled on Thursday, when Abe and Modi laid the foundation for the bullet train project. The date for launching the first bullet train between Mumbai and Ahmedabad has been fixed at August 15, 2022. Since the Japanese have taken up the project in their hands, one hopes the project will be completed on time. Japan has been running its bullet train for the last 50 years. It is so punctual that any body can coordinate one’s watch with its arrival and departure timings. In its 50-year-long history, the Japanese bullet train was seldom delayed by barely one minute. Japan will be giving a soft loan of Rs 88,000 crore to India for this Rs 1,10,000 cr project. The loan will be repaid in fifty years, and the repayment will begin after 15 years. The interest rate is at its lowest 0.01 per cent. Naturally, the bullet train will not be a drain on the nation’s treasury or on public finances. The bullet train will take two hours to cover the distance between Ahmedabad and Mumbai. The project will provide jobs to more than 20,000 people.